It refused to bring up wireless, because if you want wifi from TWC it's an extra $15/mo + $20 install fee (what a ripoff!). Since the port forwarding and DMZ modes on the DG1670A seem broken, I just settled on bridge mode. For people looking for the default user/pass, it's "admin" and "password". Whenever I made any change to the settings, the DG1670A took a very long time to reboot and start working again. Scroll down to the Summary section if you want to skip the test details. 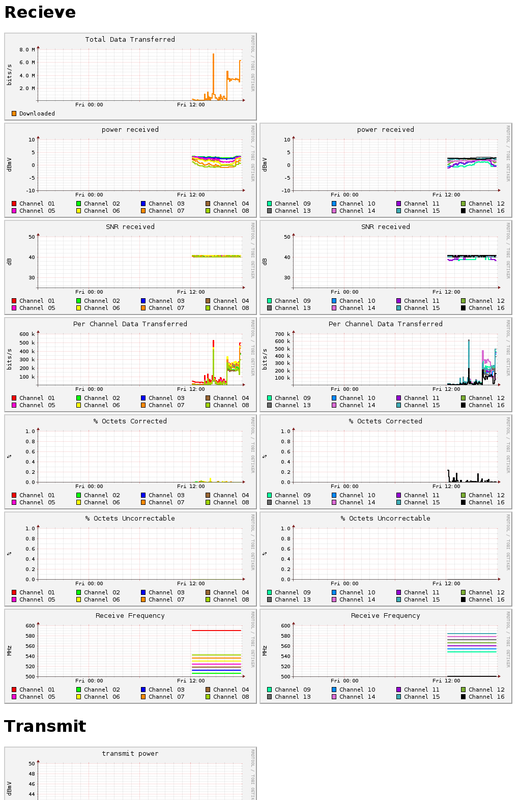 NTP server is about 60ms away and polled every minute. This is the round trip time. 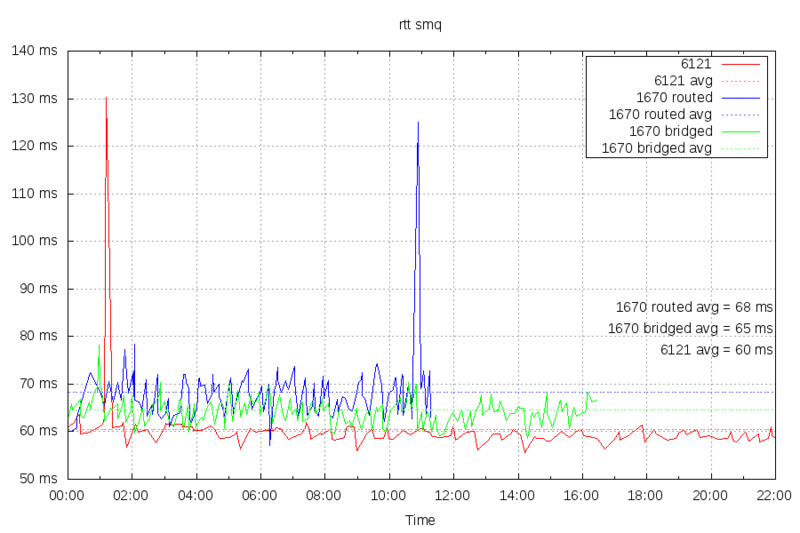 You can see DG1670A bridged mode adds +5ms and DG1670A routed +8ms compared to the SB6121. I created a simple linux program to monitor signal levels and % corrected/uncorrected octets. Source is on github. Seems like the DG1670A might have slightly higher average and minimum latency (and a much larger worse case latency), but I haven't accounted for all the variables. Not a big enough problem to look into further. I'm guessing it's using a 100HZ(10ms) network interrupt coalesce and occasionally blocks traffic for >50ms. All these setups could deliver my previous service speeds (50M/5M) without a problem. Both the DG1670A and the SB6183 are able to handle the faster 300M/20M speeds as well. I had seen people mention "port 80 and 443" being blocked in bridge mode DG1670A setups. I did not find this to be the case. Inbound or outbound. IPv4 or IPv6. It all just worked. Oddly, the router part of the DG1670A seems to still have a public IPv4 address, even in bridge mode. Seems like a waste.